Restaurants, catering companies, buffets, cafeterias and resorts often use drop-in hot wells to keep dishes warmer for longer. These pans are designed to easily drop into your countertop or buffet so they don’t protrude or take away from your streamlined surface. With a hot well, restaurant owners can count on more sales and fewer complaints associated with temperature. We’re happy to help you find the perfect drop-in hot well for your hot bar, with cutting-edge units and wells by APW Wyott, Delfield, Eagle Group, Hatco, Piper Products and Wells. Our selection includes nearly 500 unique hot well units, but don’t worry: We’re always on hand to help you narrow down our selection so that you find the right style for your needs. The first thing to consider is size and number of compartments. We have a wide variety of single-compartment hot well units as well as styles that have as many as four separate compartments for bustling buffets and cafeterias. The majority of these units are made from high-quality stainless steel for the best performance in a demanding food service environment. If you want the ability to cycle back and forth between hot and cold wells, then you might want to consider one of our dual-temp well units. Made of stainless steel, these products are some of the most versatile options for any business that relies on self-serve stations. That means you can go from housing warm pastas, side dishes and meats to displaying cold seafood, salads and more all with the same unit. 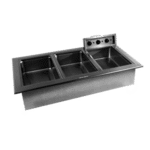 Remember, CKitchen is happy to offer the guaranteed lowest prices on drop-in hot wells, and we always ship our commercial restaurant equipment for free.